Occupational Health and Safety + Ability to work + Environment + Quality = All in One! HSEQ Online is a modern cloud service for easy and effective management of occupational health, safety and well-being as well as environmental and quality matters. 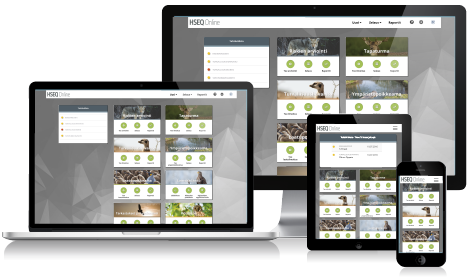 HSEQ Online is the only service where tools for managing, training, communication and legislation monitoring are combined. The service is the memory of the organisation and a development tool for achieving good company culture. Automated workflows ensure that data collection, analyses and corrective measures work together seamlessly and productively. The costs of HSEQ Online are completely transparent. A clear monthly fee includes everything: licence for the whole personnel, continuous product development, information security and back up files, server costs and main user support. The monthly fee is based on the chosen content and number of personnel. For example, the fee for a company of 100 staff members is between 300 and 600 €/month. Invite us to your workplace to discuss and present our service and we will provide a quote tailored just for you! 3T Monitor is a safety and risk management information system that can be tailor-made to suit the needs of your company. In addition to the traditional display of a computer, we have produced client-specific applications for mobile devices. When required, training, specialist support and high-quality digital learning materials are provided for initiating and activation.